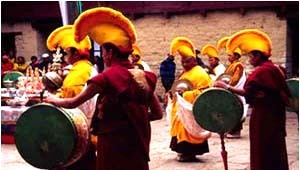 Mani Rimdu is a Sherpa festival celebrated during the fall at Tengboche Monstery in the Everest region. For five days, Lamas and Sherpas gather for "the good of the world". There are plays, masked dances, prayers, and feastings. Demons are quelled and the pious rewarded. The days are colorful and trips to the Everest region are very rewarding indeed if they can be organized during the days of the festival.